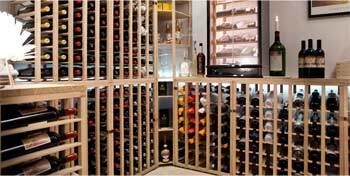 Exquisite and high end wooden wine racks in modules in the most beautiful joinery. Our most exclusive and beautiful wine rack for you, who seek the best for your wine. Moldow wine racks are among our most exclusive wine racks and can be combined in every possible way. If you would like a unique and non-binding design proposal, I'd be more than happy to help you. Click here to be contacted. 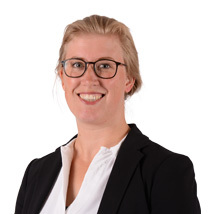 »Helene Hoier - Interior consultant and furniture designer. These are top of the line wine racks and cabinets. This series of exclusive wine racks is designed and developed by Danish furniture designer Christian Moldow. The wine racks are made in the most exquisite materials and with a unique sense of detail. 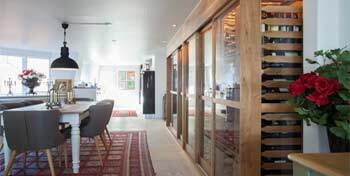 The unique wine racks are the result of an experienced background in the wine industry and the cabinet making industry. The exclusive wooden wine racks are filled with excellent details in both design and construction. There are many design options, and you can custom build your wine cellar with the exclusive bottle racks to a perfect fit. All details are well thought out and the joinery appear like small revelations when looking at the exclusive wine racks. Everything is joined together with beautiful dovetail joints with some exceptions where an invisible wooden dowel help connecting things. It is such an incredibly elegant wine rack that you cannot help falling in love. As you may know, the best way to look at furniture is using your fingers. The sensation of touch tells more about the quality of the joints than the eye does. Moldow’s wine racks will not disappoint the keen eye of your hands. The joints are just perfect and the edges and corners are sanded to perfection making them a pleasure to touch. This is Danish design at its best. 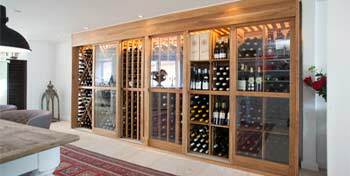 The unique luxury wine racks in the best quality wood will make your wine cellar one of the coolest rooms in your home. 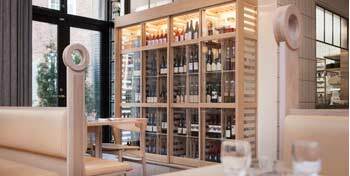 The wine racks are designed as modules, and you can combine them just the way you want it. The unique handmade wine racks can be joined on the sides and placed on top of each other. 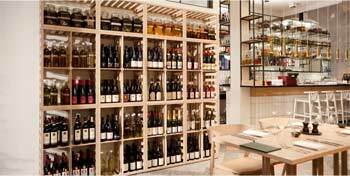 A nifty and unique noteworthy detail is that each of the wooden bottle shelves are shaped like the silhouette of a wine bottle. Moldow Wineracks are delivered to you in so-called "flat packs", i.e. flat space-saving boxes. The pre-assembled vertical parts for the wine bottles are packed along with the upper and lower parts that will serve as stabilizers for the entire construction. You are only do the very final steps in the assembly process of the modules, and it is such an easy thing to do with the most beautiful result. 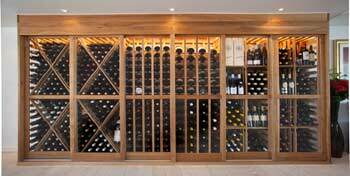 Not only are the wine cellar racks luxurious and beautiful. They are also thoroughly designed to be the perfect resting place for your wine bottles. 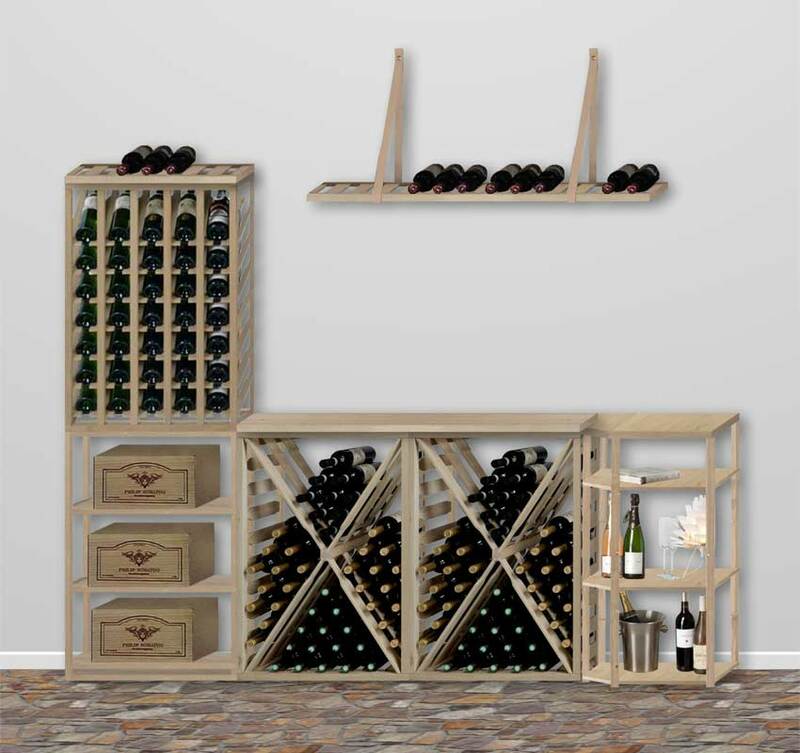 With the unique “expansion racks”, you can add columns of bottles to the width of the modules in order to tailor the racks to fit your own wine cellar. 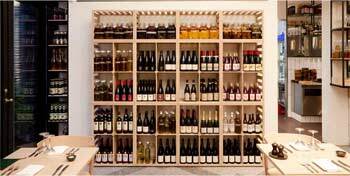 There is a corner wine rack designed to efficiently use the space in a corner of your wine cellar. 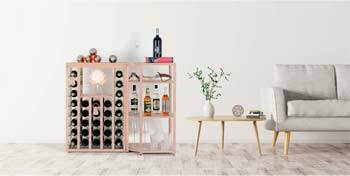 There are wine racks for standard sized bottles and racks for magnum bottles, but also for entire cases that can be put on a nice retractable shelf. The module rack called "Cigar" is designed with a shelf to store a humidor for your cigars along with with your wines. Cigars and wines are ideally stored under roughly the same conditions. Elevated humidity and stable temperature. This ensures optimum steady development of the delicious goods. However, you will have to find the humidor on your own. The Moldow Wineracks modules brings out the best of two worlds. You can have a specially designed and highly exclusive wine rack that is so close to being a tailor made custom made wine rack as it may come. As an extra nice detail there are wooden table tops that are intended for mounting on top of a module. You create a beautiful finishing touch to the entire rack that way. Even smarter and completely unique, you will find the brilliant "ladders", also be mounted on top of each module. They are available in three lengths to lay over one, two or three modules and the "steps" are beautifully designed as bottles. You now have an extra wine shelf on top of your exclusive Moldow Winerack. 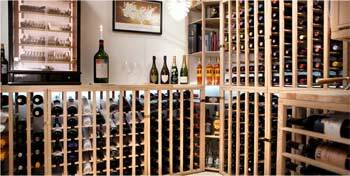 The distance between the slats or steps is slightly narrower than in the wine rack itself. Thus you can conveniently store your half-bottles of dessert wine or such. You can also store your very large bottles for that special occasion. Moldow Wineracks, specially designed following and honoring the best craft traditions, are available in three types of wood. The base is oak, then there is cherry wood and finally there is teak. All three varieties can be delivered oiled, if desired. Oak racks are standard stock items. Cherry and teak wood will be delivered by order with a delivery time of approximately three to four weeks. If you have certain wishes for special kinds of wood, it can also be done. Please do not hesitate to contact us for a chat and an offer. Please contact us for help or advice on how to customize your wine cellar with these unique wine racks. 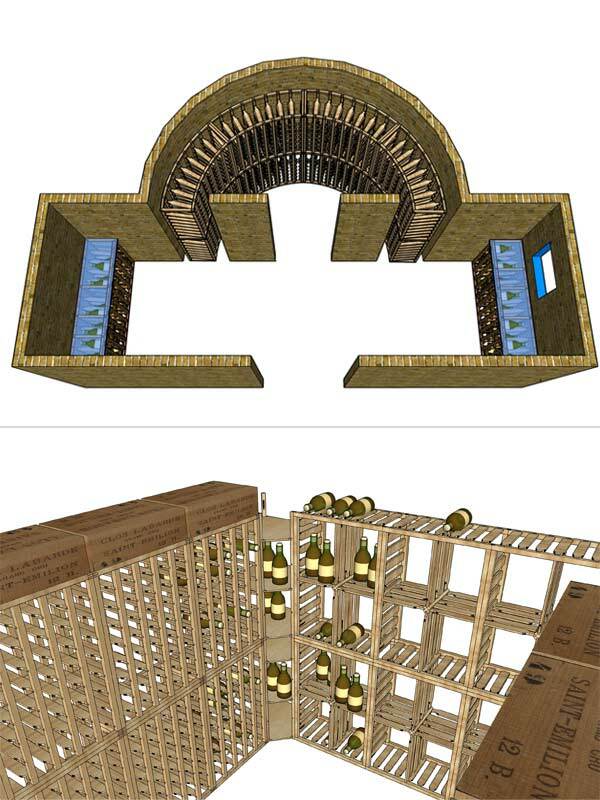 In the near future, the wooden wine racks from Moldow Wineracks will be found in our unique virtual interiour design tool on our website here. In addition, our skilled craftsmen are ready to make other adjustments to the wine racks. Fully according to your wishes.